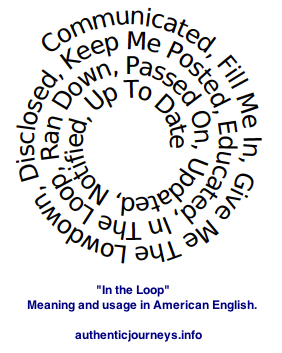 "In the Loop" and Other Phrases Meaning "Informed"
"Informed" is a word commonly used in Indian English. I will share some synonyms for these words that Americans more commonly use along with examples of use. He informed us about the schedule change. Formal Updated He updated us about the schedule change. Communicated He communicated the schedule change by voice mail. Notified He notified us about the schedule change by voice mail. Disclosed He disclosed the schedule change to us through instant messenger (IM). Educated He educated us about the schedule change through instant messenger (IM).. Everyday English Let (me/him/us) know He let us know about the schedule change after yesterday's presentation. Idioms/Used at Work Filled (me/him/them) in He let them know about the schedule change after yesterday's presentation. Gave the lowdown He gave me the lowdown about the schedule change while on the con-call yesterday. Ran down He ran down the reasons for the schedule change while on the con-call yesterday. Passed on He passed on the information about the schedule change. keep/kept/keeping (me/her/us) posted He kept us posted about the schedule change. keep/kept/keeping (him/them/me) in the loop He keeps us in the loop about the schedule change. up to date He is up to date about the schedule change. Ping/Ping Me He gave us a heads up about the schedule change. I will touch base with you when I have more information. Ping me when you have fixed the problem. Depending on the synonym being used, the structure of the sentence changes somewhat. The idiomatic forms may be more frequently used than the direct vocabulary. "You've kept me in the loop. This meeting is on target." This is a complement, it's a good thing. It means you are keeping the person up to date and informed about things. "You're not keeping us in the loop. This meeting seems to be all over the place"
This is not a good thing to hear. Your American counterparts are not happy with you and feel left out. This will damage business relationships. Jennifer Kumar is a corporate coach helping Indians build confidence in communicating with Americans. Contact her for more information today. Meaning of "How did it go?"